Sports Illustrated's MLB experts make their predictions for the World Series between the Mets and Royals, including their picks for winner, series MVP and more. Ten teams entered the postseason, but after three grueling weeks of games, only the Mets and Royals remain to fight for the World Series. For Kansas City, which downed the Blue Jays in the ALCS, this season marks a second straight trip to the Fall Classic after an unlikely repeat as the American League's champions, as well as a chance to make up for last year's heartbreaking World Series loss in seven games to the Giants. For New York, which swept the Cubs for the National League pennant, this is the team's first appearance in the World Series since 2000, when it fell to the Yankees. Neither the Royals nor Mets have hoisted the Commissioner's Trophy since the 1980s: Kansas City won its first and only title in '85, while New York last was crowned as world champion the following year. Each team now has the opportunity to break a three-decade drought and bring a championship home, but which of the Mets or Royals will emerge victorious? Sports Illustrated's MLB experts—Tom Verducci, Albert Chen, Ben Reiter, Cliff Corcoran, Jay Jaffe and Joe Sheehan—are here to make their picks and predictions for the Fall Classic and break down what should be a thrilling World Series. The Royals have the more athletic team, the better defense, the better bullpen and the better lineup (at least under AL rules), all of which play well in what should be closely contested games. But I can’t get past this simple fact: When it comes to pure stuff, the Mets will have the starting pitching advantage in every game of the series. Of all the matchups in this series—Terry Collins vs. Ned Yost, Murph Magic vs. Esky Magic, Jerry Seinfeld vs. Paul Rudd—the duel between New York's young hurlers and the relentless Royals offense is where games will be won and lost. Kansas City might very well be the best contact team in history and should have more success against Mets pitching than the Cubs and Dodgers did. The Mets' starters throw hard, but the Royals' lineup is particularly adept at handling heat. Because of that and the team's aggressive base running, stellar defense and lock-down bullpen, Kansas City has the slight edge. The Royals are a wonderfully talented and resilient club, and it is easy to imagine them winning a couple of games in the seventh and eighth innings if the Mets are forced to resort to their shaky middle relievers. But it’s hard to get around the fact that in every game of the series, New York’s starter will boast the better regular-season ERA by a significant margin. I expect the starting pitching mismatch to tip the series in the direction of the Mets. There are a great many reasons to pick the Royals to win this Series, but the one reason to pick the Mets overwhelms them all. New York's advantage in starting pitching is substantial, and with Jeurys Familia shutting the door and with New York’s lineup dangerous and clicking, I think the Mets will get enough early leads to render Kansas City's bullpen largely irrelevant. Go around the diamond position by position, and it appears that the Royals have the edge more often than not, but the Mets' advantage in starting pitching nonetheless stands out. Jacob deGrom, Noah Syndergaard and Matt Harvey have answered the bell with a strong start nearly every time this postseason, missing enough bats to cover for the team's shaky infield defense and working deep enough into games to help offset a bullpen that lacks the depth of the Royals' unit. New York is also the only team that will start a lefty, albeit not until Game 4 (Steven Matz). The contact-centric Royals are especially adept at countering hard stuff, which will put pressure on New York's defense and may confer a slight advantage relative to power-focused teams, but it's not as though the Mets lack for quality off-speed stuff, and Kansas City's lack of patience at the plate may let those hard-throwing starters stick around longer. This should be a tight series, but to me, the needle points to the team that wins the arms race. Because Ned Yost is a witch. The core conflict in this series is no secret: the Mets' power starting pitching against the Royals' contact hitting. Kansas City's ability to put the bat on the ball has been a key trait for successful postseason teams of late: Since 2009, the team with the better regular-season contact rate is 34–14 in playoff series. The Royals had the best contact rate (84%) in baseball; if they can put balls in play, they will find grass against a Mets team whose best two defenders have been injured (Ruben Tejada) or marginalized (Juan Lagares). The Royals are here because of a handful of big innings in which they strung together hits against the Astros and Blue Jays. Do they have a couple more of those in them against Matt Harvey, Jacob deGrom and Noah Syndergaard? The Mets' edge is in the first six or seven innings; the Royals' edge is everything after. They have a better, deeper bullpen, anchored by the Mariano Rivera of the Plains in Wade Davis, and a balanced lineup. Their contact skills aside, the Royals start seven players who hit at least 13 homers this year, and what Ned Yost's lineups lack in variety—he's started the same one in all 11 postseason games—they make up for in left-right balance and speed/power mix. The set lineups aren't a bad idea, because it's when Yost starts making decisions that things go awry. Nevertheless, his Royals have won four of five postseason series and are 18–8 the last two Octobers. Double, double, toil and trouble, indeed. Who will be the World Series MVP? The guy was made for these two starts in this series. Terry Collins, noticing some fatigue creeping into Jacob deGrom’s stuff, made Harvey the lead dog pulling the sled, just as Harvey would want it. His start against the Cubs in the NLCS was a reminder of his greatest quality as a pitcher; with superb secondary stuff he can throw early in counts, Harvey can carve up a team in multiple ways. The Royals' staff has done some heavy lifting this postseason, with 41 innings logged (vs. 25 2/3 for the Mets), and there's no reason why Ned Yost won't continue to ride them in the World Series. It's true that Kansas City’s staff is deeper than it was a year ago, with the trio of Davis, Kelvin Herrera and Ryan Madson as perhaps the team's biggest weapon during the regular season. But Madson has allowed four home runs this postseason already and may be running out of gas; Yost may need Herrera and Davis for a few extra batters in high-leverage situations. Yost has been referring to Davis as the best reliever in baseball through the postseason, and the man's got a point. The righthander who came to Kansas City in the James Shields trade allowed just seven runs in 67 1/3 innings in the regular season and hasn't allowed a run over 6 2/3 innings in the playoffs. If the Royals are going to do this, they’ll need Davis to continue being the best reliever on the planet. There was Daniel Murphy; there were the Mets’ aces and Jeurys Familia; there was Curtis Granderson and, eventually, Lucas Duda. 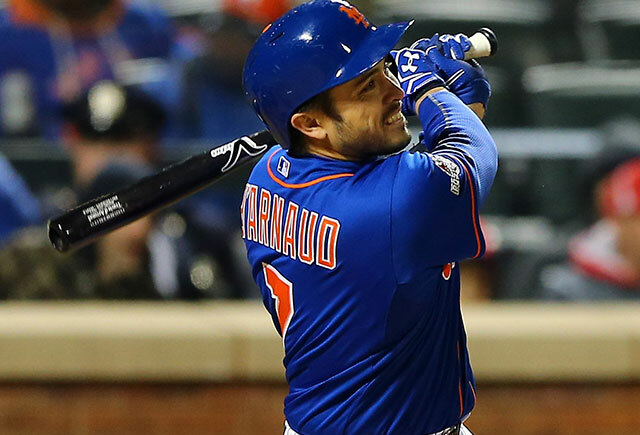 But d’Arnaud, the oft-injured and often overlooked third-year catcher, has already had some big moments this postseason of his own. He’s the one who has caught every inning of that dominant work being done on the mound, and his three homers rank him second on the Mets behind only the magical Murphy. His sturdy defense will prove particularly valuable against the Royals’ aggressiveness: He threw out a strong 33% of base stealers during the regular season and allowed just a single passed ball. Duda was in a nasty slump for most of the first two rounds of the playoffs, going 2-for-21 with 13 strikeouts and being benched against fellow lefty Jon Lester in Game 1 of the NLCS. But he broke out in a big way in Game 4, going 3-for-4 with a walk, two doubles and a home run, driving in five of the Mets’ eight runs as they clinched the pennant. Duda, whose home runs tend to come in bunches, says he had finally gotten the timing of his leg kick right at the end of the NLCS, and while the five-day layoff could throw him out of whack again, he’s doing as much hitting as he can to keep that rhythm. With nothing but righthanded starters set to pitch for Kansas City, I’m guessing he’ll pick up where he left off against Chicago. Matt Harvey gets the headlines, and he's lived up to the hype this postseason. So has deGrom, not only with his brilliant Division Series Game 1 start opposite Clayton Kershaw, but also in his two starts since, both of which found him able to bounce off the ropes time and again, finding ways to win with something less than his best stuff. It says here he rises to the occasion with two strong starts, including the clincher opposite Johnny Cueto. Davis will eventually find his way into the games, probably after Yordano Ventura or Ryan Madson or Drew Butera has pitched to the middle of the Mets' lineup, and score four saves to grab the MVP award. Who will be the unlikely hero of the series? His command and stuff are back after an inconsistent start to his first post-Tommy John surgery season. Hochevar should leap-frog Ryan Madson in the bullpen hierarchy of Ned Yost. The righthander is slated to go in Game 4 against Steven Matz at Citi Field, and while on the surface it may seem like the Mets have a clear edge, Young has quietly had an excellent October. 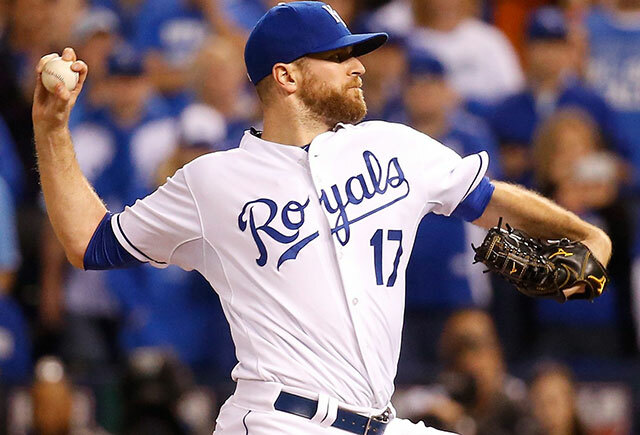 In Game 1 of the ALDS, he came in relief of Yordano Ventura and allowed one run over four innings with seven strikeouts. In the critical ALCS Game 4, he handled the juggernaut Toronto offense, allowing just two runs over 4 2/3 innings. But Young has been rolling since late September, and though you’ll hear plenty about the star rookie Matz entering Saturday's game, don’t be surprised if the old dude comes out and throws a gem to help Kansas City take control. The veteran infielder has made just six plate appearances in the postseason so far (with one hit), but he could receive twice as many in this series. For starters, he bats lefthanded, and all of the Royals’ starters are righthanded. The Mets will also have an extra spot to fill in their lineup at designated hitter for the games played in Kansas City. Not only were 13 of Johnson's 14 regular-season home runs struck against righties, but he has reasonable career numbers against Games 1 and 2 starters Edinson Volquez and Johnny Cueto (a combined 5-for-20 with a double, a homer and four RBIs). A good start will force Terry Collins to continue to squeeze him into the lineup. With Matt Reynolds off the roster, Nieuwenhuis becomes the least likely hero on the team I picked to win the Series. Not only has he appeared in just one game for the Mets this postseason, going 0-for-2 after being double-switched into Game 4 of the NLCS, but he was also sold from the Mets to the Angels in May, then returned to New York via a waiver claim in June barely more than two weeks later. How unlikely it would be for a player the Mets didn’t want five months ago to emerge as their big World Series hero. Royals fans might howl in protest if you suggest that Salvador Perez takes a back seat to his opposite number in this series, but aside from the contrast of his incredible durability—he has more innings caught than any AL catcher in either of the past two years—against d'Arnaud's penchant for season-interrupting injuries, the numbers are on the Mets' side. D'Arnaud is the better hitter, batting .268/.340/.485 for a 128 OPS+ this year; Perez hit .260/.280/.426 for an 89 OPS+ on the season. D'Arnaud also edged Perez in both caught stealing percentage (33% to 31%) and stolen bases per nine (0.46 vs. 0.5), though admittedly, those are minuscule. But where d'Arnaud has the biggest edge is in pitch framing: According to Baseball Prospectus, he was 13.3 runs above average in that department this year, good for sixth in the majors. Perez was 0.8 runs below average, 42nd among the 69 catchers with at least 1,000 framing chances. That amounts to snatching extra strikes for his pitchers, and it's one reason why I think the Mets will prevail. This series sets up well for Conforto, with the Royals starting nothing but righthanded pitchers, most of whom throw hard and will fall behind in the count if you let them. The standard for "unlikely hero" is set pretty high in the Season of Murphy, but Conforto could have a big series from the seventh spot in the lineup. What/who will be the X-factor in the series? Can you imagine what would happen to the pitching plans of both teams if Game 1 were rained out? Go back to the 1996 World Series, when a Game 1 rainout forced the Yankees and Braves to play five straight days. No problem back then: Game 1 starters Andy Pettitte and John Smoltz simply took the ball on short rest in Game 5, no questions asked. The Game 1 starters this year, Edinson Volquez and Matt Harvey, never have started a game on short rest in 283 combined career starts (218 of them by Volquez). Anybody ready for Kris Medlen vs. Bartolo Colon in Game 5? A Game 1 rainout would benefit the Royals much more, as a schedule with games on five straight days would reward the deeper bullpen. We have no idea which Johnny will show up in Game 2 when he takes the mound against Jacob de Grom. The memory of his Game 3 dud in the ALCS, in which he allowed eight runs over two innings, is still fresh. But we do know that Cueto is capable of a masterpiece: He threw one with the stakes at their highest, Game 5 of the ALDS, as he allowed only two hits and two runs over eight innings against the Astros. 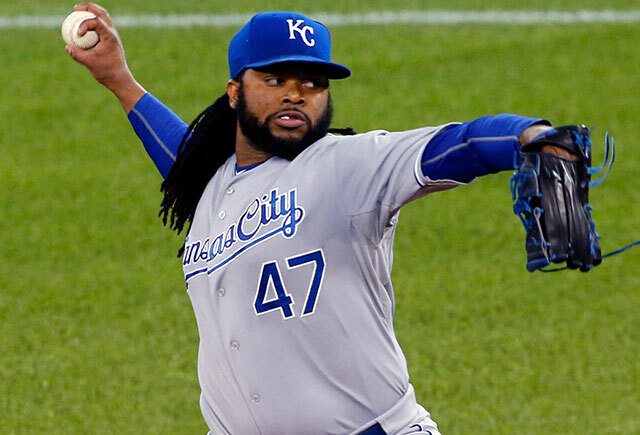 Cueto was brought to Kansas City to be the ace, but he’s been far from it, and after he was blasted by the Jays, It will be fascinating to see how quick Ned Yost will be when handling his righthander. Cueto should have a better chance pitching well because his Game 2 start will come at home, but then again, he’s Johnny Cueto, and you just never know what Johnny we’ll get. Even though they swept the Cubs in the NLCS, the Mets didn’t leave Wrigley Field entirely unscathed. Cespedes exited the clincher early due to a sore shoulder—one that he insists was not the result of playing golf but came from doing pushups, which he performed because Wrigley’s antiquated facilities meant he couldn’t get in his normal weightlifting session. Cespedes could hardly raise his arm just six days ago, though he is said to be fine now. If he isn’t, a compromised Cespedes won’t only hurt the Mets on offense, but also in the field. They will be much better off if they can rely on his strong arm to prevent, say, Lorenzo Cain from doing something like scoring from first base on a single. Of all the reasons to favor the Royals in this Series, the one that gives me most pause is the discrepancy in team defense. In a close series, the extra outs the Royals make in the field and the extra outs the Mets give away could prove to be the difference. That said, though the Mets lack any fielders as superlative as Lorenzo Cain, Alex Gordon or Alcides Escobar, they are hardly a team of butchers. In fact, during the regular season, the Mets actually ranked ahead of the Royals in park adjusted defensive efficiency, finishing third in the majors in that category to the Royals’ tenth. There may have been lot of Juan Lagares in those numbers, but Yoenis Cespedes’s arm could be a significant factor against a Royals team that is aggressive on the bases. Cueto looked like just the ticket the Royals needed when they traded three pitching prospects for him in late July: a front-of-the-rotation starter who could go toe-to-toe with any other team's ace. It hasn't worked out that way: Including his three postseason starts, the 29-year-old righty has been lit up for a 5.27 ERA and 4.31 FIP in 16 turns in Royals blue, just eight of which have been quality starts. It appeared that he was on the right track over the course of his final four regular-season starts after a clear-the-air meeting with the coaching staff and Salvador Perez, the upshot of which was that he asked the catcher to set up lower, which produced better results. The magic hasn't been there in October, however, and the Royals were concerned enough about the possibility that Cueto would again get rattled on the road that they slotted him at home for Game 2. With a contract of more than $100 million at stake this winter via free agency, Cueto has a chance to rewrite the narrative that surrounds him and provide a counter to Jacob deGrom. If he does, he can significantly alter the course of this series. Duffy hasn't had much opportunity to impact the Royals' postseason, matched up as they were against the righthanded pop of the Astros and Blue Jays. Against the Mets, though, he could play a critical part, throwing multiple-inning outings against a team whose lefthanded power has played up in the postseason. He's a bridge from the Royals' shaky rotation to their strong trio at the back of the bullpen, and he could find himself pitching out of big spots three or four times in this series.